Blacktype won the 2016 Commonwealth Turf Cup. Photo by Jim McCue, Maryland Jockey Club. 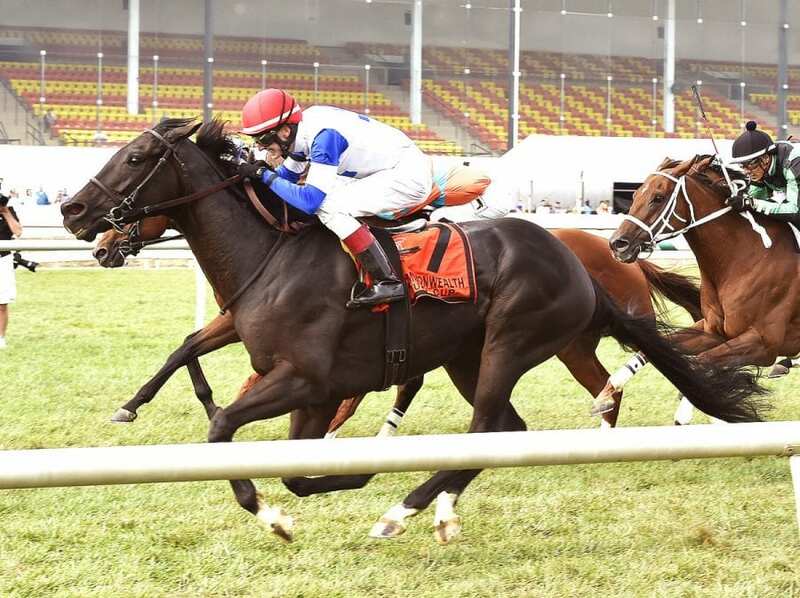 Jump Sucker Stable’s Blacktype could be the bridge from the Commonwealth Turf Cup and the renamed Baltimore/Washington International Turf Cup (G2) to be run Saturday, Sept. 30 at Laurel Park. Blacktype, a French-bred son of Dunkerque trained by Christophe Clement, prevailed by a half-length in last year’s extremely competitive Commonwealth Turf. He returns to Laurel to try to become the first repeat winner of the Grade 2 one-mile race on the grass. The $200,000 Baltimore/Washington International is the headliner for Laurel Park’s “Class on the Grass” event. The 12-race program includes eight turf stakes, three of them graded, with $850,000 in purse money. There are two featured Grade 3 stakes for 3-year-olds, the $200,00 0 Commonwealth Derby and $150,000 Commonwealth Oaks. The Baltimore/Washington International drew a field of eight that includes Grade 1 winner Ring Weekend, multiple Grade 2 winner Tower of Texas, and a pair handled by Eclipse Award winning trainer Chad Brown: Projected and Catapult. Blacktype, who drew post seven, won his most recent start, a 1 1/16 miles optional claimer on Sept 9. at Belmont Park. It was his first victory of the season highlighted by a third-place finish in the Longines Dixie Stakes, the race which precedes the Preakness at historic Pimlico. Prior to his Commonwealth Turf Cup victory in 2016, Blacktype won the Oceanport Stakes ((G3) at Monmouth Park. Horacio Karamanos, who won the 2013 Commonwealth Turf on London Lane, will ride Blacktype. Ring Weekend, co-owned by St. Elias Stable and West Point Thoroughbreds, is a well-traveled, accomplished veteran who leads the Baltimore/Washington International field with just over $1.5 million in earnings. He picked up his Grade 1 victory in the 2015 Frank Kilroe Mile at Santa Anita Park. He also has wins in the Tampa Bay Derby (G2), Seabiscuit (G2), Bernard Baruch, Saranac (G3) and Hill Prince (G3). He is winless in seven starts this year, but trainer Graham Motion saw some positives in his most recent race, a fourth in the Bernard Baruch on a yielding turf course at Saratoga on Sept. 4. This will be Ring Weekend’s 28th career start, but his first at Laurel. He will be ridden by Hall of Fame jockey Edgar Prado. The gelded son of top sire Tapit has been at Motion’s stable at the Fair Hill Training Center at Elkton, Md. and the trainer said the Baltimore/Washington International is a good fit. Nik Juarez will ride Juddmonte Farm’s Projected from post two for Brown. Projected was the runner-up in three listed stakes in France for Andre Fabre in 2015 and was sent to the U.S. for the 2016 season. He missed the entire campaign but has been very busy this year with one victory and three seconds in seven starts. He was second to World Approval in the Dixie on Preakness Day and second by a neck to Ballagh Rocks in the Poker (G3) at Belmont. Projected’s dam, Deliberate, is a half-sister to champion Flintshire, who was trained by Fabre and Brown. Catapult, owned by Woodford Racing, is a son of the outstanding turf sire Kitten’s Joy. A four-time winner in 11 starts, he is seeking his first graded stakes victory. He was fourth in the Dixie. Feargal Lynch will ride the 4-year-old colt from post four in the Baltimore/Washington International. Completing the field are the Irish-bred Glorious Empire, the 8-year-old Xmas Sky, twice a winner on the Laurel turf, and Special Ops, who has won two of three starts for trainer Mike Maker since being claimed in June by Skychai Racing.